A MODERATE avalanche danger remains above 1000’ where triggering a hard slab avalanche 2-4+ feet thick is possible. These could be found on all aspects and may be remotely triggered. Watch for old wind slabs along ridgelines and avoid cornices. Evaluate snow and terrain carefully. Heightened avalanche danger exists region-wide including parts of the Kenai Peninsula, Western Chugach Mountains and the Talkeetna Mountains. Both natural and human triggered avalanches have been observed in these areas this week. Check out Hatcher Pass Saturday forecast HERE and recent observations in Chugach State Park HERE. Know before you go! Triggering a deep slab avalanche 2-4+ feet thick remains a possibility. It has been over two weeks since significant snow fell and almost a week since a large scale Northerly wind event loaded slopes and increased avalanche hazard. Since then, generally quiet weather has occurred yet people are still able to trigger avalanches. 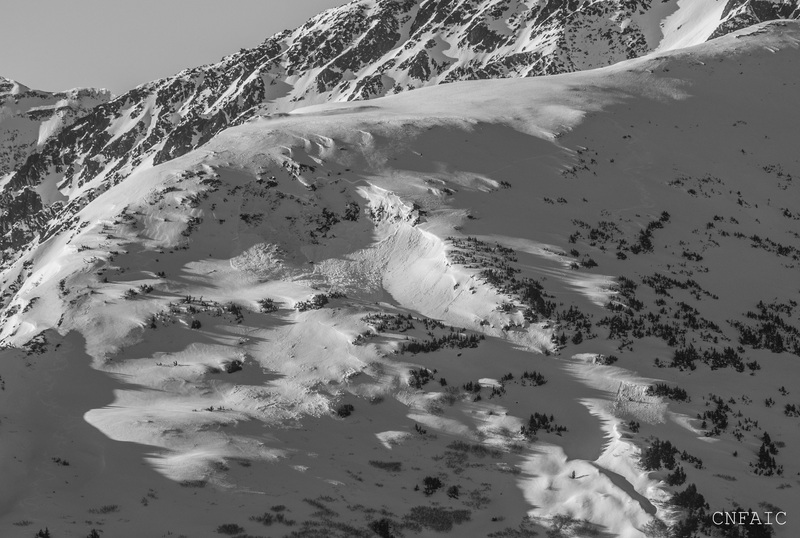 Many of these have been remotely triggered from the side or below, such as on Friday when a skier remotely triggered a large avalanche while descending a low angle slope on Raggedtop Mountain in Girdwood Valley. The problem is old buried weak layers from January. There are facets sitting on a slick melt/freeze crust at the mid elevations and facets mixed with buried surface hoar at the upper elevations. To add to this, strong Northwest winds that ended Thursday caused unusual loading patterns opposite the usual Easterly direction. This means the typical windward slopes with thinner weaker snow may be more loaded and ‘trigger spots’ may be lurking just below the surface in unexpected places. Observers over the last few weeks have found poor structure along scoured ridges and under sastrugi. The tough thing is, our hard-pack snow surface appears safe and stable but this is not the case. Keep in mind that no obvious clues may be present until the slope releases. It may be the 10th skier or snowmachiner onto a slope that finds a thin part of the snowpack (a trigger point). Triggering a slab remotely from the side or below is possible. Take a moment to visualize the consequences if the slope does slide. Remotely triggered avalanche by a skier two days ago in the Girdwood Valley. This was on an Southeasterly aspect around 3,000' on a lower shoulder of Raggedtop Mtn. Two snow pits dug on Taylor Pass show one of the weak layers we are concerned about along with the difference in slab height in a short distance. Wind Slabs: Easterly winds will be moderate to strong today, yet little snow is available for transport to form fresh wind slabs. However, this is something to be on the lookout for if you head into the hills. Additionally, old hard wind slabs may be lurking on a variety of aspects due to the unusual loading patterns this week. Smooth supportable surfaces where the snow is hollow sounding are suspect, especially if the slope is unsupported in steep rocky terrain. Taylor Pass on the left photo and Pastoral Glacier on the right. Winds last week stripped the majority of the soft surface snow away. You can see evidence of an old avalanche on the Pastoral Glacier. Sunny skies were over the region yesterday with ridgetop winds light from the West. Overnight, winds shifted to the East and have picked up to the 10-20mph range. Temperatures warmed to the mid 20'sF along ridgetops yesterday and in the mid 30's at 1,000' before dropping to the teens and single digits overnight. Today, clear skies are expected this morning before clouds begin to stream in associated with a low-pressure spinning in the Bering. Light snowfall is expected this afternoon through tonight bringing just a trace of snow to our forecast area. Ridgetop winds will continue to increase from the East through the day and should range between 20-30mph. Temperatures look to stay cool, in the upper teens along ridgelines and near 30F at 1,000'. Tomorrow, Monday, we can expect light showers to continue that may dust the old hard surfaces with a inch or two of new snow. The middle of the work week looks a bit uncertain, but warmer temperatures and a chance for snow flurries is expected.